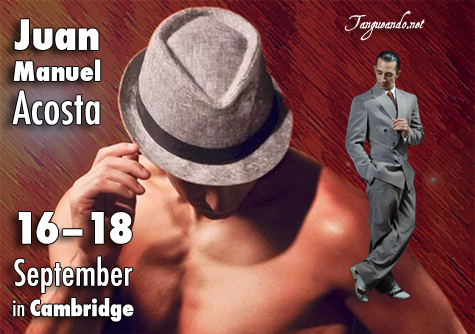 We were very happy to have again with us our first tango teacher, talented dancer and dear friend Juan Manuel Acosta. In his fourth visit in Cambridge, Juan Manuel gave a number of tango workshops and a Tango seminar aimed at improving both the aesthetic and technical parts of the dance as well as giving us an insight into the research, practice and experimentation that leads to clean, flowing movement. Continuing on his workshops in the previous years and our work at the classes, Juan Manuel gave a number of workshops designed to help us progress our understanding of Tango dance and its technique. His excellent fluid movements, the result of decades of hard work, inspired us once again. He worked for the internationally acclaimed dance companies «Tango x2» (Miguel Angel Zotto), «Tango Pasión» (Hector Zaraspe) and «TangoKinesis» (Ana María Stekelman and Alfredo Arias) with which he performed all over the world. Juan Manuel has also accompanied «Sexteto Fabio Hager». After he returned to Buenos Aires he worked at some of the best known “Casas de Tango” like Taconeando, Señor Tango, Esquina Carlos Gardel and Tango Porteño. Juan Manuel is regularly visiting the UK to teach and perform. Together with his stage career and his research into movement as a stage and contemporary dancer, Juan Manuel's teaching is focused on Tango salon and how tango is danced in its social, cultural and popular expression. TANGO 1: Ochos in different directions, working with deep dissociation. TANGO 2: Giros, using the dissociation. Tango: Basic sequences of tango salon.